What is a Windows Dedicated Server? A UK Windows Dedicated Server offers the user full control over how and where their websites are hosted. UK Windows Dedicated Servers are often located in Data Centers and offer more freedom over other common forms of hosting solutions such as Shared Hosting. 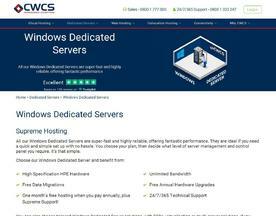 The main benefits of choosing a UK Windows Dedicated Server are that the user gains high performance, stability and control, though this often comes at a price reserved for websites that receive large volumes of traffic. 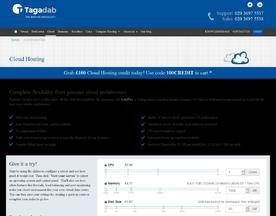 If you’re looking for similar online services to a Dedicated Server, try our Cloud Hosting or Linux Dedicated Hosting categories. High performance Windows servers with SSD as standard and choice of OS. 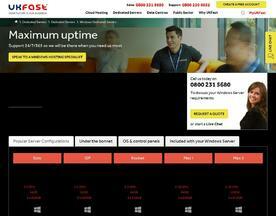 Dedicated support 24/7 from UK-based qualified Windows engineers and backed by 100% network uptime guarantee for maximum performance & reliability. Our high specification HPE hardware Windows dedicated servers provide high reliability, and ultrafast performance. Fully managed 24/7/365 with free data migrations, and free annual hardware upgrades!